Cluster is an magnetospheric research project, consisting of a constellation of four identical satellites. Part of the first Cornerstone Mission in the European Space Agency's long-term space science programme, the Cluster II satellites were built to replace the original Cluster mission, which was aborted after Ariane-5G's maiden flight in June 1996 failed to launch the satellites. The mission's objective is to research the Earth's magnetosphere and its interaction with the solar winds, via four identical satellites flying in formation which take simultaneous measurements to provide the most detailed three-dimensional study of changes and processes taking place in near-Earth space. 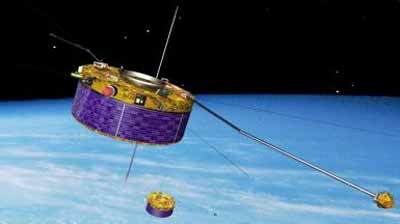 The four satellites were launched in 2000 on two Soyuz-U Fregat rockets. Astrium was lead industrial contractor for the development and manufacture of the Cluster II satellites, heading a team of European aerospace indsutry partners from 14 European countries.